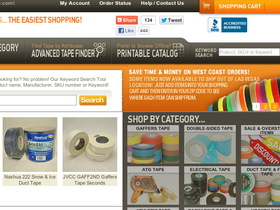 Shop Find Tape online at FindTape.com for a broad assortment of gaffers tapes and clear double-sided film tapes. To provide you with an easy way to try a few products at once, Find Tape created the Gaffers Tape Challenge Pack and the Double Coated Clear Film Tape Test Pack. These packs give you an economical way to sample different brands & grades for your specific needs. After you receive the pack you'll be given a unique code to rate how well the tapes worked in your application. FindTape.com also sells electrical tape, hockey tape, athletic tape, packaging tape, racers tape, foam tape, and much, much more. For all your FindTape.com discounts, FindTape.com promotions, FindTape.com sales and FindTape.com coupons remember to visit 58Coupons.com. Click link to shop clearance at FindTape.com and you'll find savings up to 60% on a wide variety of tape options. Buy more, save more with FindTape.com...you can save up to 20% with volume purchases. Right now you can find a wide variety of electrical tape on FindTape.com, now from as low as $0.39 per roll. Act now and take advantage of a low price on masking tape from FindTape.com, now from just $0.24 per roll. Check out FindTape.com and you can find duct tape from as low as $0.56 per roll.